Life's Key utilizes volunteers in a number of ways, but none reaches an inmate more personally than our course commenters. Each exam an inmate completes has a selection of "What Do You Say" questions. These allow the inmate to articulate their thoughts and express their feelings towards specific aspects of the course. Our commenters are given a set of exams to review each week, and their job is to provide feedback in the form of encouragement and insight which the inmate will see when their graded exam is returned to them. Commenters are vital to this ministry. 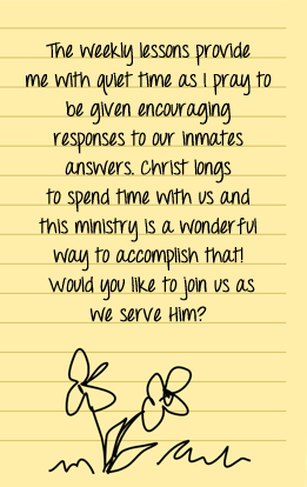 The direction they provide is greatly appreciated by inmates as evidenced by the many letters of gratitude we receive. The human interaction keeps them engaged and gives them something to look forward to each time they complete an exam. Our commenters need to have a good knowledge of God's Word as well as a good idea of what is being taught in the courses that they are commenting on. Living near our office is not necessary. We gladly mail out courses in need of counseling all over the United States each week. If you feel that God has laid it upon your heart to volunteer in this way, please contact Life's Key for more information. For more information about volunteer opportunities, click the INFO button to the left.